What is the Fair Food Program? 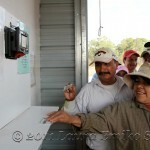 The Fair Food Program (FFP) is a unique farmworker- and consumer-driven initiative consisting of a wage increase supported by a price premium paid by corporate purchasers of Florida tomatoes, and a human-rights-based Code of Conduct, applicable throughout the Florida tomato industry. The price premium and the Code of Conduct, which were developed by tomato workers, growers, and corporate buyers in a groundbreaking collaboration, form the foundation for a new model of social accountability. The FFP emerged from the Coalition of Immokalee Workers’ (CIW) successful Campaign for Fair Food, a campaign to affirm the human rights of tomato workers and improve the conditions under which they labor. The high degree of consolidation in the food industry today means that multi-billion dollar brands on the retail end of the industry are able to leverage their volume purchasing power to demand ever-lower prices, which has resulted in downward pressure on farmworker wages. The FFP reverses that process, enlisting the resources of participating retail food giants to improve farmworker wages and harnessing their demand to reward growers who respect their workers’ rights. The FFP provides an opportunity for those corporations to bring their own considerable resources to the table – their funds and market influence – to help forge a structural, sustainable solution to a human rights crisis that has persisted on U.S. soil for far too long. In the process, the FFP will help build the foundation for a stronger Florida tomato industry that can differentiate its product in produce aisles and restaurants on the basis of a credible claim to social responsibility and so better weather the challenges of an increasingly competitive marketplace. What are the major elements of the Fair Food Program? Does the Fair Food Program cover all farmworkers harvesting Florida tomatoes or just the members of the CIW? Nearly all of the members of the Florida Tomato Growers Exchange – representing over 90% of the industry – are participating in the FFP. 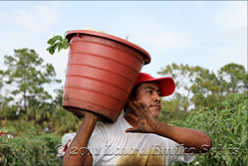 Therefore, all farmworkers harvesting Florida tomatoes for those growers are covered under the Fair Food Program. These growers employ approximately 30,000 workers at any given moment during the season and, due to high turnover, between 80,000 and 100,000 workers over the course of a season. Which corporate buyers are participating in the Fair Food Program? Yum Brands (2005), McDonald’s (2007), Burger King (2008), Subway (2008), Whole Foods Market (2008), Bon Appetit Management Company (2009), Compass Group (2009), Aramark (2010), Sodexo (2010), Trader Joe’s (2012), Chipotle (2012), and Walmart (2014) are participating in the Fair Food Program. All twelve companies have agreed to pay a premium price for more fairly produced tomatoes, and to shift their Florida tomato purchases to growers who comply with the Fair Food Code of Conduct. How is the Fair Food Program monitored? Beginning in the 2011-12 growing season, the Fair Food Standards Council (FFSC) oversees implementation of the FFP. The mission of the FFSC is to monitor the development of a sustainable Florida tomato industry that advances both the human rights of farmworkers and the long-term interests of growers through implementation of the Fair Food Program. For the previous two seasons, the FFP was monitored by Verite, an Amherst, MA-based non-governmental organization that promotes and monitors fair labor practices across the globe. In 2011, Verite CEO Dan Viederman was named Social Entrepreneur of the Year by the Geneva-based Schwab Foundation for Social Entrepreneurship. How does the Fair Food Program Premium (the “penny per pound”) reach the workers? The Fair Food Program Premium is passed down along the supply chain – from the retail level to the grower level – and ultimately is added as a bonus to workers’ paychecks as part of the grower’s regular payroll process. The FFP bonus is clearly marked as a separate line item on the worker’s paystub. Over $11 million in FFP Premiums have been paid out since January 2011 (updated: January 2014). These payments are ongoing, and as more buyers join the program as a result of the Campaign for Fair Food, the bonuses workers receive will grow commensurately. The FFP Premium payment mechanism for buyers varies. Some have elected to fold the FFP Premiums into the final price they pay for their produce, akin to fair trade premiums, while other buyers issue separate checks directly to participating Florida tomato growers that reflect the amount and variety of tomatoes purchased. Are the Fair Food agreements legally binding? Yes, the Fair Food agreements ­– between the CIW and retailers, and the CIW and growers – are legally enforceable by the CIW.